referred to as “chicken skin” because of the raised bumps that form on the arms, legs or face. The most common misdiagnosis for KP is acne. KP forms whiteheads that look similar to acne on the face or body, but the whiteheads aren’t soft like acne. KP whiteheads are usually harder and tougher, unless they become infected which is quite common if you don’t treat it. Another tell-tale sign is that KP is not usually oily like you might see with acne. Another way to tell the difference is that you can sometimes pop the whitehead off a KP bump (because it’s caused by keratin build-up and not bacteria like acne). 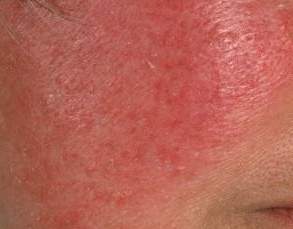 Treating KP with acne products can cause KP to turn red and dry, resembling Rosacea. nt. The main difference is that Rosacea is usually very dry, whereas typical acne is usually oily (when not being treated). Since acne products are made to dry up excess oil, this could be very detrimental to someone who has rosacea. It could possibly make the area more red and inflamed, and even drier. A common home treatment for Rosacea is heavy moisturizer, but that could possibly cause acne. A very light daily exfoliation and then moisturizer for sensitive skin will make the area temporarily red, but the long-term benefits are usually worth it. If the redness persists, you might also need something like BC’s Protective Services Calming Fluid to soothe the skin. The exfoliation will get rid of the dead dry skin, and leave the skin smoother and ready to accept the calming fluid and moisturizer. 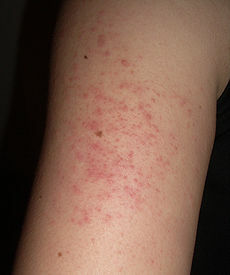 If you use a physical exfoliator, just be careful not to exfoliate too much at one time, it could make the Rosacea worse. You might also want to see a dermatologist to find out if you need a prescription medication. ometimes, eczema is even caused by fungal infections, so it’s hard to separate the treatment for the two. 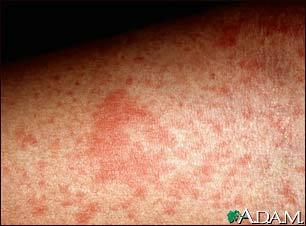 Commonly, the same issues occur for Eczema sufferers as Rosacea. Usually a heavy moisturizer is used, but that can sometimes lead to clogged pores and acne. The same treatment option of light exfoliation and then moisturizer will usually work for Eczema on the face. For Eczema on the body, a body lotion with antioxidants is a great benefit. To treat a possible fungal infection, Tea Tree Oil is fantastic. For more information about Eczema and treatment options see my posts titled “What is Eczema?” and “Treating eczema”.